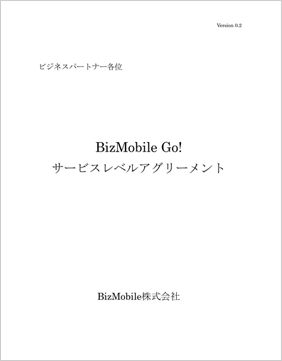 Since BizMobile Go! was developed as a cloud-based service from the beginning, it has been highly recognized for its large-scale MDM usage. 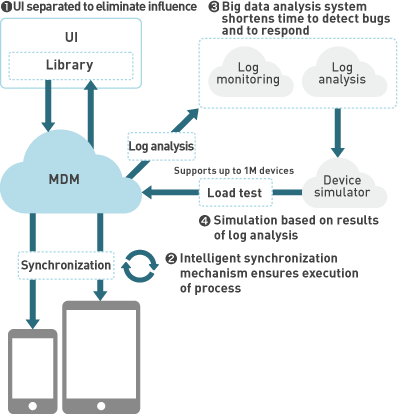 Our proprietary device simulator based on the first big data analysis system for MDM in Japan enables us to simulate behavior and measure end to end performance beforehand. This sets BizMobile Go! apart from other MDM services that requires usage before knowing its performance. We can provide a large-scale implementation of over 10,000 devices. The first and the largest data analysis system in the MDM industry is constantly running behind our service. The system has had a great effect in the continual improvement of BizMobile Go! quality, bug detection, and the reduction of response times. The first big data analysis system in the MDM industry combines Treasure Data and Tableau for analysis, and Splunk for monitoring. The big data that has been analyzed so far was for inventories, orders, and deliveries. The logs collected by BizMobile could be meaningless individually, but pooling a large number of them will reveal general issues with devices. As collecting individual logs was not considered to be useful for system analysis, on-premise MDM services (installed within an enterprise) only collect data temporarily when a problem occurred to be sent to the MDM vendor for analysis. However, such analysis were unable to elucidate most problems, and usual action taken was to wait until the problem to be repeated. Bugs and flaws detected from a large pool of logs are useful for discovering vulnerabilities that were previously unnoticed, and make useful evidence when an enquiry is sent to the OS vendor. We keep records of bugs and flaws of old OS versions and archived logs from the start of the MDM service for our support center to determine issues at our customer site.